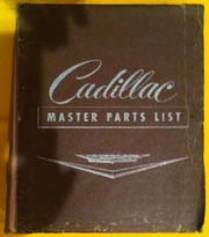 Group of 66 different Jam Handy training 35mm filmstrips for Chevrolet from 1940 to 1962 in original canisters. Do not have the narrative records. Lit-0768. Price for all - $500. 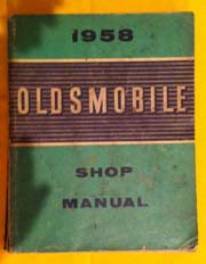 Chrysler Master Maintenance Manual (shop manual), 8 ½ x 11 inches by 5/8 inch thick. Softbound. Print date 1935, covers 1934, 1935, and 1936 vehicles. Cover is rough but all there. Inside has a few grease stains, but is a very useable book. Stock number Lit-0313. Price $40. (3) books concerning the Datsun Fairlady series (roadsters and Z’s). These books are a set that was printed by Creative Boutique (Neko) in Japan. Book one is titled “Fairlady Volume I” and covers the history of the Datsun Roadsters up through the first Fairlady Z. 156 pages, printed in 1977. The second is titled “Fairlady Volume II”. 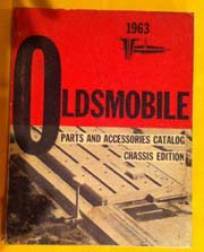 This volume gets into the racing heritage of these cars 143 pages printed in 1977. The third is titled “Fairlady Volume III The ZX Sensation”. This book has 137 pages, and was printed in 1978. THESE ARE PRESTIGE BOOKS! These 3 books are 10 ¼ x 10 ¼ inches, hardbound and have Japanese text, but wonderful pictures. I bought the set new, and looked through the books a couple of times. These books still have not only the dust jacket, but also the original slip covers. Stock number Lit-0316. Price for the set of 3 $350.00. Factory Nissan Motor publication printed in 1978 titled “Datsun 280ZX” and has English text and 191 pages. This book is bound in heavy cardboard, and is the same basic size as the three Neko books. I also purchased this book new. It did not have a slip cover. Stock number Lit-0317. Price $95.00. 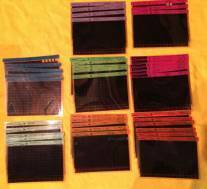 What I believe to be a complete set of parts microfiche for 1981 Datsun. This includes the following models: 280ZX, 310, 310GX, 510, Pickup, 210, 810, 200SX, and Stanza. Lit_0950. Price $30. 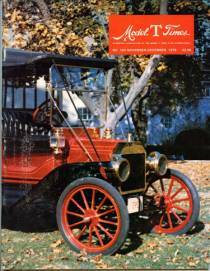 Lincoln factory service bulletins from the years 1925 and 1926. Eight different bulletins that cover the service of different items on the car. These bulletins are 8 ½ x 11 by 4 pages. Topics include “Generator Clutch”, Camshaft Exchange”, Crankshaft Balance”, “Gasoline Gage (their spelling)”, “Steering Wheel”, “Timing”, “Shock Absorbers”, and “Timing Chain”. Average used condition (some smudges). Stock number – Lit-0314 . Price $200.00. The MG Guide by John Christy and Karl Ludvigsen published in 1958 by the Sports Car Press. Softbound, 5 14 x 8 inches by 125 pages. Good used condition, with some wear showing on cover. Stock number Lit-0195. Price $15.00. 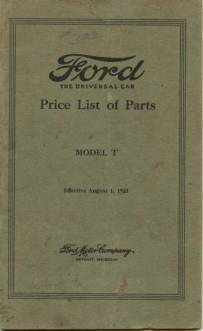 Carter Model DRO carburetor for 1925 Oldsmobile cars Parts Price List and Instructions booklet. 3 ¼ x 6 7/16 inches by 16 pages. Cut-a-way views, adjustment, parts listing, actual part pictures, troubleshooting. Excellent condition. Stock number Lit-0254. Price $25.00. 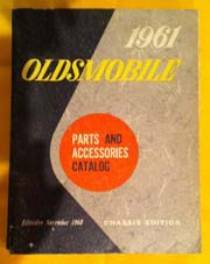 Oldsmobile Chassis Parts & Accessories Catalog dated November 1960 – 8 ½ x 11 x 585 pages. Excellent used condition, except about half a dozen loose pages (present). Coverage 1941 to 1961. Yes, the J-2 is covered. Lit-0540. Price $100. Firebird, A Source Book, by Thomas Bonsall. First edition, third printing, 1981. 7 x 10 inches by 144 pages. Like new condition. Stock number Lit-0198. Price $10.00. GTO – The Big Little GTO Book, by Albert Drake, published in 1982. 8 ½ x 11 inches by 179 pages. Average used condition. Stock number Lit-0199. Price $10.00. 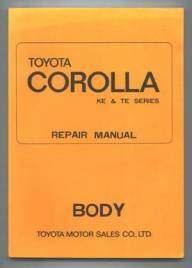 Toyota factory Corolla KE & TE Series Body Repair Manual (English). Publication number 98048 print date 1970. 7 ¼ x 10 inches by ¼ inch thick. Excellent original book Lit-0340. Price $10.00. 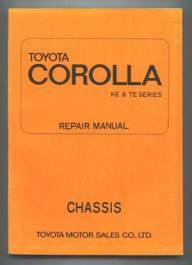 Toyota factory Corolla KE & TE Series Chassis Repair Manual (English). Publication number 98048 print date 1970. 7 ¼ x 10 inches by ½ inch thick. Excellent original book Lit-0341. Price $15.00. 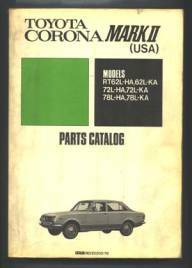 Toyota Corona Mark II (USA) Parts Catalog models RT-62L-HA, 62L-KA, 72L-HA, 72L-KA, 78L-HA, 78L-KA. 7 x 10 by 1033 pages. Excellent used condition Lit-0346. Price $35.00. 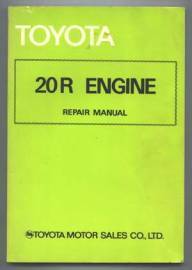 Toyota 20R engine Repair Manual publication date 1979 7 by 10 by 3/8 inch. Excellent original condition. Lit-0352. Price $35.00. 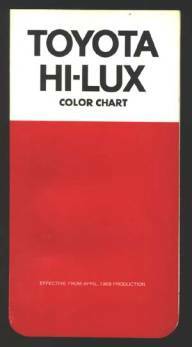 Toyota Hi-Lux Color Chart folder printed 1969. Excellent original condition Lit-0353. Price $5.00. 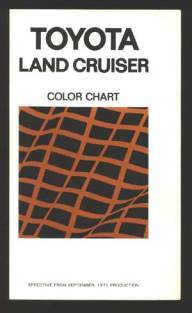 Toyota Land Cruiser Color Chart folder printed 1971. Excellent original condition Lit-0354. Price $5.00. 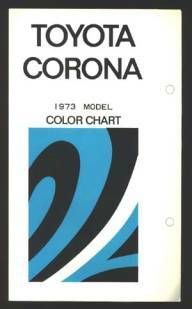 Toyota Corona 1973 Model Color Chart. Excellent original condition Lit-0355. Price $5.00. 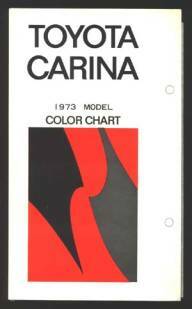 Toyota Carina 1973 Model Color Chart. Excellent original condition Lit-0356. Price $5.00. 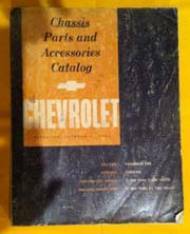 Toyota Dealer List, Distributors, Area Offices, Parts Depots, Models, Specifications, & Accessories Winter 1972-1973. 9 x 4 by 67 pages. Excellent used condition. Lit-0348. Price $5.00. 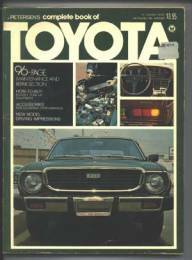 Toyota 1979 Owner’ Guide. 8 ¼ x 5 ½ by 32 pages. Very good original condition. Lit-0349. Price $10.00. 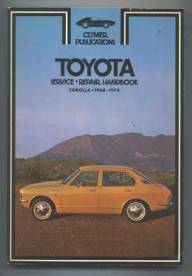 Toyota 1979 Pickup Owner’s Manual 8 ¼ x 5 ½ by 86 pages. Good original condition. Lit-0350. Price $15.00. 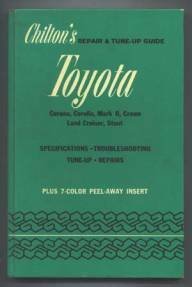 Petersen’s Complete Book of Toyota approximate print date 1975. 8 ½ x 11 by 192 pages. One page loose from binding, otherwise good used condition Lit-0344. Price $10.00. 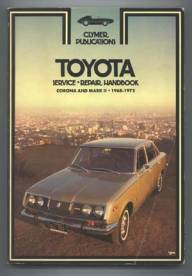 Chilton’s Repair & Tune-Up Guide Toyota 1972. 6 ¾ x 10 ¼ inches by 175 pages. Excellent original condition Lit-0345. Price $10.00. 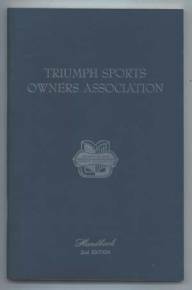 Triumph Sports Owners Association Handbook, 2nd Edition, 5 ¾ x 9 by 120 pages, excellent original condition, Lit-0407. Price $10.00.